Some people hear the phrase "social media campaign" and think it's only for big businesses with marketing departments and millions of followers - but that's not true. A social media campaign is any series of posts to social media promoting one product or service. The official definition is "a coordinated marketing effort to reinforce or assist with a business goal using one or more social media platforms". Campaigns aren't just posting about your brand either. The key difference is that a campaign is measurable and aims to increase focus and targeting on a specific goal. So - odds are, if you sell anything, you should be developing social campaigns to help with a sales goal. Now that you know you need it, let's talk about what goes into creating and running successful campaigns. By November 1st, 2016 we will have 200 new followers on our twitter account and no more than 20 lost followers. These are simple goals, but they have a date and they have a specific Mark that we can hit and measure. Your goals can be as simple or more simple just make sure that you have a date, a measurable mark to hit, and that you check your goals again at the end of the campaign. As you work on the campaign, make sure you're checking in with your goals. Check them through the weeks and make sure you're on track. For example, half-way through the month you should be at 50% of your revenue goal. It's really that simple. How are you going to measure and determine success? You need to have the tools in place or reporting set up to figure out if you've met your sales goals or not. You'll also need tools that allow you or your team to schedule out the social media content. My favorite tool is CoSchedule, but Buffer and Hootsuite work just as well. Not only is it important to actually schedule your campaign, but you need analytics and stats while your campaign is running. CoSchedule connects to Google Analytics which makes it easy to track how your posts are performing on social media. You've probably heard of keyword research before. If you haven't, check out this mini guide from google. Before you develop your content for your campaign, you'll want to do some research about your topic and your audience. A fantastic research tool is this Keyword Research Database. Let's say, for example, I'm promoting a new business planner. I'd type "business planner" into the research tool and it'll tell me the top related searches. By looking at the results I see that "small business planner", "business planner notebook" and "daily business planner" are often searched on google. I can now use these terms in my social posts to help people find my product under those search terms. I'll also be sure to use these terms on my actual sales page to rank higher on Google for those terms. These keywords MUST be used organically. Do not list all the terms you find at the end of your page - that will not get you good rankings and it'll be obvious what you're trying to do. Researching terms will also help you see how big your audience really is. If you'll be using any kind of ads for the campaign, it'll be a good idea to sign up for Google Adwords to get even more in-depth tools and research capabilities. Now that you know your goals, have a platform and know your key terms, it's time to make your content. That doesn't just mean your social posts, it'll include photos, videos, and maybe even a landing page. Landing pages can be useful when you're running an Instagram campaign. Because Instagram doesn't track clicks easily, setting up a landing page can help you get a better idea of how many people are really visiting your site or shopping for your products. Photos and videos can help you better explain yourself or help your post stand out among other social media posts. Canva, pixlr, and adobe illustrator are all great tools for designing graphics. A simple iPhone video with editing on iMovie or movie maker will turn a short post into a ton of info on twitter or facebook. Use these tools to your advantage and make your post stand out in a sea of information. You'll also need to create the text content for your campaign. I like to do this section in google docs or directly in CoSchedule's social queues so that I only need to write 10 posts then mix them up on different channels with various photos or videos. 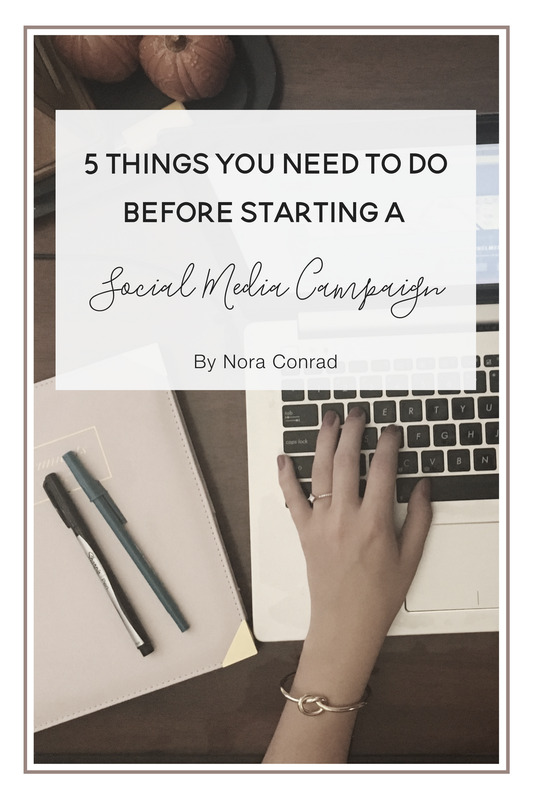 The last step is to schedule your campaign and check on it! Checking if you're meeting your goals is just as important as setting them. If you're not hitting your marks, you'll have time to adjust the content before the campaign ends. Whether you're launching a new course, product, or advertising for an affiliate - setting up a solid campaign will help you be more successful. If you're looking for ways to expand your affiliate income, try checking out sites like BlogHer or FameBit and sign up for campaigns through them. I make a couple extra hundred per month with sites like these while supporting products and services I love. What steps or tips did we miss? Let me know in the comments!